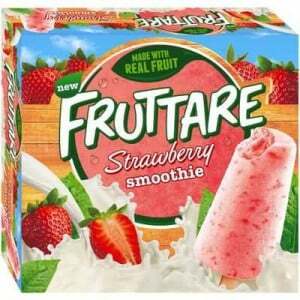 I really enjoy Streets Fruttare Fruit strawberry smoothie – it tastes so yummy and luscious and is so enjoyable on a hot day. The pieces of fruit are very nice and I find it very hard to stop at just one. Kids love these, I like the addition of fruit, even though I know it doesn’t make ice cream healthy. It makes me feel a little bit better feeding it to the kids. I bought when on special, it was a 2 for offer, so really great value for money. Street’s Fruttare strawberry smoothie is a taste of heaven on a warm day,fresh and delicious it is a nice change from the regular ice creams. I love these and the feel like they might be a healthy alternative to ice-cream. My kids have them after dinner during the week. Fruttare Fruit Smoothies are real fruit pieces blended into a frozen fruit smoothie – soft, creamy and sweet – perfect for a Summer day! A little more expensive than others, but worth it! This is a very very creamy icecream with lovely big chunks of strawberries, I bought them for my son but ate the lot they are delicious as generously sized. How would you rate Streets Fruttare Fruit Smoothie Strawberry?